TomTom Go 500 Review – should you buy it? - Which Sat Nav? 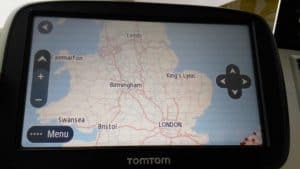 Home » Reviews » TomTom Go 500 Review – should you buy it? The TomTom GO 500 review was something I was looking forward to putting through its paces. This device sits in the middle of the range offered by TomTom. If you didn’t already know, I have a certain affinity to these mid range devices. It could be a television, a car or even a food mixer and I am automatically drawn towards that option. Why? Well, because on the one hand I find it difficult to settle for the basic level or entry level of anything. On the other hand, I find it difficult to justify spending lots of money on a top of the range product. I mean, do people really purchase these products because they use the additional options offered or are they purely looking to impress their friends? Either way, I was looking forward to this TomTom Go 500 review as it is the mid range option. Let’s take a look and see whether it’s something you should consider purchasing. Like my previous reviews, I will jump straight in and look at what’s good and what’s not so good about the TomTom Go 500. The TomTom Go 500 like their other devices is rectangular in shape with smooth rounded edges. The device looks good with its mixture of black and grey plastic trim. It has a rather understated design that ensures it will suit any vehicle. The unit weighs only around 235 grams and therefore is light enough to carry in a small bag. This is important if you do not want to leave the device unattended when you leave the car. My only gripe with the design of the device is the easiness that the screen becomes scratched. It was only in my possession a couple of hours before a large scratch appeared on the upper right hand side of the screen. It seems that the offending article was the the zipper of my jacket. It caught the screen when I placed it on my lap to input an address and damaged it. No amount of polishing or rubbing seems to makes any difference. It therefore looks like the scratch is here to stay and unfortunately there’s not a whole lot that I can do about it. ? The “scratchability” (not sure if that’s even a word!) of the screen is certainly something to keep in mind when purchasing the device. Particularly, if you intend to remove it from the vehicle and carry it around in your bag. If so, then a sturdy case to keep the sat nav in would be a sensible purchase. Gone are the days where when you purchased a sat nav a case came with it as standard. The case that I subsequently purchased was the one you see on the right. It was cheap, sturdy and most importantly came with a screen protector! The TomTom Go 500 comes with a 5inch screen. 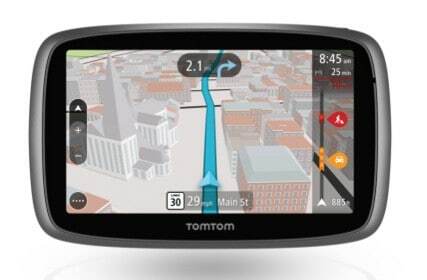 The 6inch version is a little more expensive to purchase and is branded as the TomTom Go 600. The 5inch model however suits my needs as the screen is bright and clear. As per my other reviews, screen size is a matter of personal preference. Your decision may well be based upon the size of your vehicle – a 6inch screen may be a little large for something like a Fiat 500 but a 5inch screen would probably be too small for a Toyota Landcruiser. The use of this unit for navigation purposes is much the same as the TomTom Go 50. The main difference is the big improvement in the responsiveness of the device. The screen now responds to a slight tap from the finger. You are now no longer required to keep tapping the screen with ever increasing force in order to get a response. This makes finding addresses a much easier and less stressful process. It annoyed me to no end on some of the earlier models having to thump repeatedly on the screen in order to get a response when attempting to find an address. Inputting your destination into the sat nav is fairly straightforward. The TomTom Go 500 finds most addresses without too much difficulties. The pinch and zoom function is a solid addition as it enables you to look in more details at map locations. I would typically use this when exploring my vicinity. It’s great for finding a green area or a park to walk the dogs. Like the TomTom GO 5000 this device gets you from A to B without too much fuss. 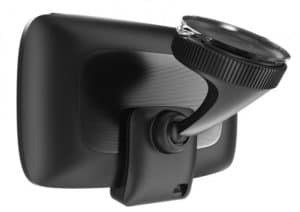 The TomTom Go 500 uses the “Click and Go” mounting system that is also used on the 5000/6000 models. It’s a vast improvement on the Easy Port mounting system used on the entry level TomTom Go 50 . Like the earlier versions the mount is fixed to either the dashboard or the windscreen. It is secured in place by using the turn and lock suction cup. I have secured the device to both the dashboard and the windscreen and can confirm that the anchoring is far superior on the windscreen. When the cradle is on the dashboard a sudden turn of direction or a change in temperature within the vehicle (usually due to the air conditioning) would see the suction move and the device fall. I did not however, have any issues when the sat nav was fixed to the windscreen. I forgot to turn the suction dial the first couple of times when I wanted to readjust the position of the cradle. It then took a whole lot of effort to pull the mount free from the windscreen when it was in lock mode – that can only be a good thing! There is a magnetic mount within the cradle and it is this feature that really makes the difference. It’s possible to connect and remove the sat nav device to the cradle using only one hand. If your anything like me you only remember to remove the sat nav as your getting out of the car. With the other mounts, I would find myself getting back into the car to take down the device to put into the glove box. This though works by just clicking in easily because of the magnetic connection. It’s also very easy to remove and quickly hide from potential thieves. When I buy a new sat nav device one of my first tasks is to connect the device to the computer. This time however, I used the device for a few days prior to starting the updating process (mainly because I was in the process of changing internet providers at home). This ensures that the software is updated (if it’s required) and the maps are also brought bang up to date. It’s also an ideal opportunity to register the device with the manufacturer. This ensures that the warranty is effective from the date of purchase. In essence the whole procedure should be easy and straightforward to complete. I connected the device to the computer via the supplied USB cable and waited for it to be found by “My Drive Connect”. 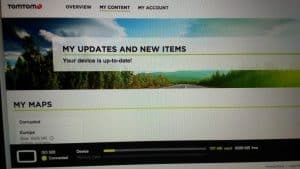 This is the TomTom platform that’s required to monitor and update your device. This software has replaced the old “TomTom Home” program that previous models used to update maps etc. It’s also meant to simplify the process for the user. 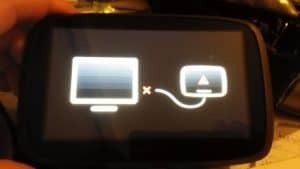 To say that I experienced some difficulty in connecting and updating my TomTom Go 500 would be an understatement of gigantic proportions. It baffles me why manufacturers continually make things difficult for their customers. The Lifetime Map Updates are a big attraction to the consumer as you feel that your purchase will last a long time before it needs to be replaced. Unfortunately it’s of no use whatsoever if you are unable to utilise the maps and the device properly. In order to provide some context as to my frustration, I shall attempt to shed some light on the steps I took in attempting to update the maps. At least Holly’s Happy and smiling…. and then after another couple of hours the following screen was on the computer ? ? ? ? There no stopping Happy Holly………. So despite being closer to completion the expected time to finish the update went up to nearly 14 hours…….what on earth was going on? Now, I’m not exactly the most patient man, but surely this was beginning to border on the ridiculous? And probably more annoyingly, Happy Holly was really beginning to get on my nerves! 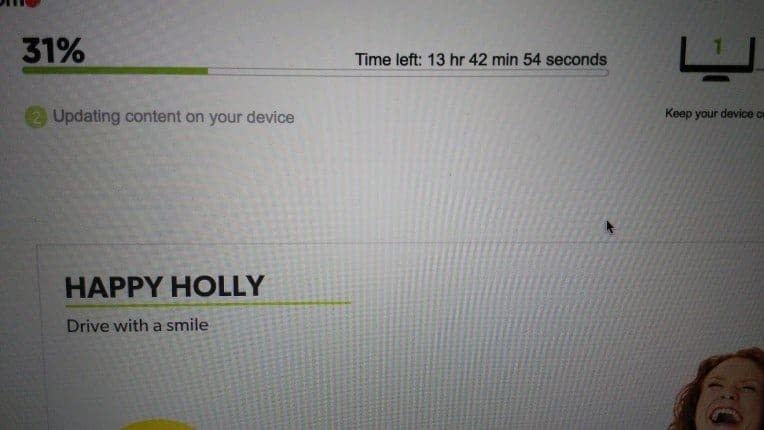 She just kept on popping up on the screen smiling and telling me how I’ll be driving with a smile…..after over four and a half hours fiddling and trying to update this device I promise you, I wasn’t particularly happy Holly! Nope Holly wasn’t finished, she was happy to keep appearing and throwing her head back and her hands up in the air. Happy Holly was really starting to get on my nerves and she and the TomTom Go 500 were very close to being thrown out of the window! How useful – a sat nav with no maps! In desperation I plugged the Mac directly into the router to provide wired internet, in the vain hope that it would speed up the process. Eventually after around 8 hours of waiting, the update was completed and I expected to be in a position to join Happy Holly on the road. But alas, there was a problem…. Now the expletives that came out of my mouth cannot be put into print. 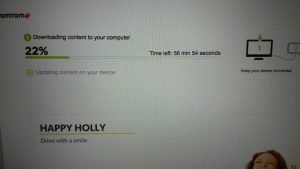 How can it be that after connecting to TomTom My Drive, following the instructions, having to jump through hoops and then being made to wait an eternity for the process to complete……….that I’m now left with a device that had no maps available? Surely, TomTom were only having a laugh and once I pressed ”ok” everything would be ok, right? Silly me, of course they wouldn’t be! So now apparently I have an updated device that has no maps. That’s about as much use as an ashtray on a motorbike! A chocolate fireguard would be far more useful – at least the melted chocolate could be used to cover a cake! This sat nav is now nothing but an expensive paperweight! No prizes for guessing that I wasn’t a happy little bunny! An updated device that won’t work – great! The good news is that the TomTom is up to date. However, the bad news is that the map is corrupted. So, in fact more bad news than good in this instance. There was nothing for it but, to carry out another factory restore of the device. An attempt that didn’t have the required solution. Unfortunately, it would seem that the updated map requires more space than is available on the sat nav unit. The updated map requires 6293mb of space however, there is only 6286mb of space left on the device. The sat nav no longer comes up on your desktop as an external flash drive. It’s therefore not so straightforward to delete the other files to make space for the updated map. As a matter of principal I am refusing to purchase another memory card as in my view the device should be able to handle an updated map. If not, then surely TomTom should provide memory cards as part of the original purchase. The few days that I did have to try out the TomTom Go 500 (pre updating issues) I was impressed. The device was responsive and found every address without any hiccups. The real issues began when I tried to update the software and maps. The entire process is akin to pulling out your front teeth whilst standing on a bed of hot coals. Oh, and it’s a bloody frustrating and time consuming process too! 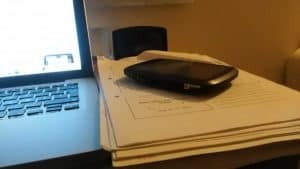 As of today, I have a device that sits on my desk like an attractive paperweight. 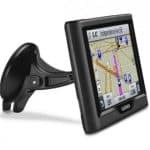 I have updated lots of sat nav devices using a number of different programs. This was however, the most frustrating and annoying process I have attempted to date. If I cannot solve it by perseverance (and the internet of course!) then I shall contact customer services (who are in fairness a helpful bunch) in order to get it fixed. In reviewing products I do however, have to be honest and tell it as it is. I can only share my particular experience with a product – be that a positive or a negative experience. The TomTom GO 500 should have received an excellent mark. It is however, severely let down by some pretty fundamental issues. The map updating process and the vulnerability of the screen let the TomTom Go 500 down. Once I have the device up and running then I shall update this review to reflect that. In the meantime however, if you would like to read some further reviews of the product or find the latest offers then head over to <a style="color: #0000ff;" href="http://www.amazon farmacias similares viagra.co.uk/gp/product/B00L222D50/ref=as_li_tl?ie=UTF8&camp=1634&creative=19450&creativeASIN=B00L222D50&linkCode=as2&tag=whsana09-21″ rel=”nofollow”>AMAZON to find out more. What should have been a solid device is let down by an easily scratched screen and numerous connectivity issues. Difficulty in connecting to your computer and the map updates are larger than the memory available on the device. 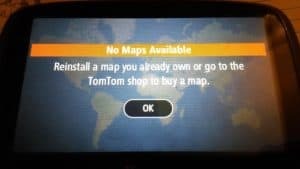 Why do TomTom manufacture a device that is unable to hold an updated map? Having to buy a memory card to use your sat nav is not acceptable hence our disappointing grading. What is Space Junk? - Should we be Concerned? I remember a few years back , one of my friends bought for himself one of these GPS devices from the same brand , we noticed the same issue about map updating. It surprises me that it still happens in more actual models of the same device. Anyway i have to say TomTom worked fine most of the time. The problem with map updating was not something big but rather a bit annoying sometimes. To be honest though, these GPS systems by the company behind Tom-Tom were absolutely horrible. I know because my parents owned one and we were constantly going down the wrong road when traveling. I’m guessing with all the technology now, it sounds as though they have figured it out. My only worry here is that now I have a wonderful Iphone 6 with great navigation. Is it really necessary to get a GPS? Excellent review on the Tomtom.like you I always go for the middle of the range purchase so I was considering the Tomtom however after reading your review I have decided against it as I am prone to being a bit careless and scratch things easily.I need a more robust satnav and I am disappointed it does not come with a case and map update feature is quite poor .Thanks a lot for the detailed review. Great job on this review! Wow, very detailed! I have been a garmin lover, but I’m always interested in the latest gps devices. Even though my phone has navigation it is so much easier, in my opinion, to turn on a seperate device and just leave it running. I have used TomTom devices in th past and I have not been super impressed. I liked your advice to buy products in the middle range. I was disappointed to hear about all of the problems you had with trying to update the maps on the tomtom 500. I too have had problems with my garmin. It seems you run out of storage space within the device itself. I’ve got to say – as someone who doesn’t drive – that when I came across your article I wouldn’t be riveted, but I really enjoyed reading this. I’ve also got to agree with you when it comes to buying midrange stuff. I always find that doing it that way means that you always get the most bang for your buck. 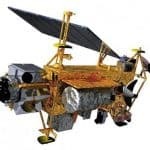 It sounds like you really know about sat navs, so if I’m ever in the market for one I’ll know where to go. Thanks for the review, I watch the apps in you tube and its accurate. Maybe i get one to install in my 2010 honda. 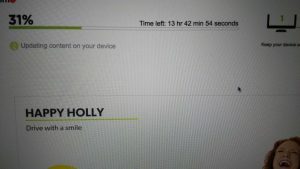 I really enjoyed your review of the this particular TomTom and there was a time when I loved purchasing these types of devices. I was particularly drawn to the Garmin and like you I experienced issues with updates. What are your thoughts on the options provided by vehicle manufactures? The integrated option provides similar options without the need of a second device (i.e radio & GPS) and if serviced at the dealer will eliminate the need to update maps. What a great review of the TomTom Go 500! I was seriously considering buying this particular model of GPS for my wife. There are times when she has to go to places that she has never been to before and I really thought that the TomTom Go 500 was the perfect Christmas gift. But after reading about the difficulty that you had updating it, I have decided to by the Garmin Nuve 2589LMT. It’s gotten several really positive reviews. Thank you for helping me decide on which GPS to get my wife for Christmas! That’s disappointing, I as looking for a good sat nav after using google maps on my phone for a good few years now, and as were doing more trips away now I thought an “upgrade” to a sat nav would be ideal. But the updating issues would render it useless for me as I like to just plug and play which my phone does perfectly well. Think I’ll be looking at other alternatives or just stick to my phone..